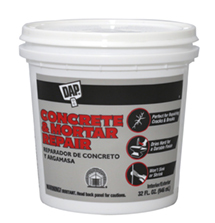 A high-strength patching compound for repairing cracks or breaks in concrete and mortar joints. It can also be used to patch and spot level interior or exterior concrete and masonry surfaces. It dries to a durable, hard finish. Provides a non-shrinking patch.